Bob Mionske outlines a case that will get you steamed in two seconds. Here's a judge advising an injured cyclist that she should not have been biking on the road after she got hit from behind by the driver who received a token $50 fine. The driver was actually appealing. A bicyclist was killed Monday night and the common denominator with this death and other recent bicyclist deaths was darkness. The death was at 7:30 pm and it was done at the hands of a driver who fled the scene in a hit-and-run. Not much details here, as both the TBO and and Times stories are short reports with the same info. The magazine that covers the bicycle industry has a wonderful and touching story about how Tour de France winner Gino Bartali smuggled ID photos to a convent to produce phony ID papers for Jews fleeing the Holocaust in 1943. Bartali told soldiers that he was simply on training rides when, in fact, he was sneaking ID info inside his bike frame and saddle, Bicycle Retailer and Industry News reported. Bartali put it beautifully: "Good is something you do, not something you talk about. Some medals are pinned to your soul, not your jacket." This morning I had the lucky chance to appear before the Pinellas County Bicycle Advisory Committee to offer a presentation about SWFBUD and the type of work we have done in the past few years. It was great to see some familiar faces such as Tom Ferraro, who chairs the Pinellas BAC; members such as Cheryl Stacks, who does a terrific job as St. Petersburg's city bike/ped coordinator and Chip Haynes of Clearwater, who designed the fliers for SWFBUD's Bicycle Bash when we held it in St. Pete. It was also nice to see Tim Bustos and Becky Afonso of the Florida Bicycle Association (Tim, FBA's executive director, also gave a presentation). Scott Jessup of Chainwheel Drive and Glen Gullickson of Bicycle Outfitters were also in the house. As a member of the Tampa-Hillsborough Bicycle Pedestrian Advisory Committee, I can appreciate the passion and commitment to bicycling showed by the Pinellas folks. St. Pete and Pinellas are ahead of Tampa and Hillsborough in regard to bicycle infrastructure, so my SWFBUD work has focused more on the Tampa side of the Bay. Take a look at a past Bash. 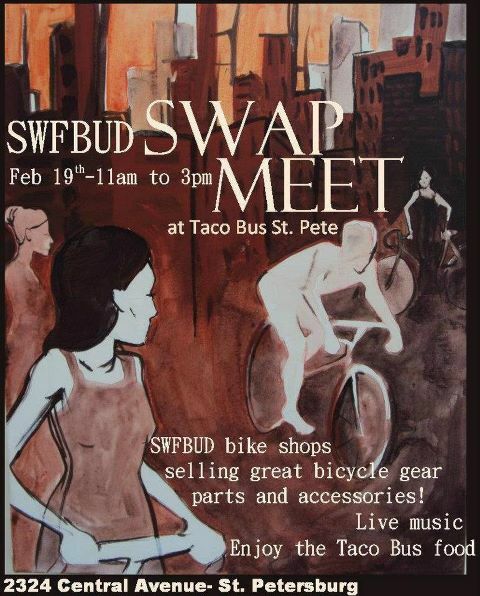 -- Organizing the SWFBUD Swap Meet. -- Prompting Hillsborough County to initiate the Bicycle Safety Action Plan in response to bicyclist deaths in Tampa Bay. Read the BAM story in Creative Loafing. --And working to create a host of other local bike infrastructure improvements such as bike lanes, sharrows and improved intersections. Glen Gullickson strikes again. The wrench at SWFBUD member shop Bicycle Outfitters writes another letter with a strong message. If Glen can write letters, you can, too. Contact your local congressman or congresswoman and tell them to keep the bike and pedestrian money in the Transportation Bill. 100% behind the effort to preserve this TE! promote both of these points to our elected officials, IF THEY CHOOSE TO! 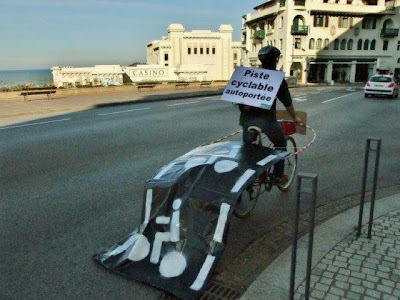 The bicycle/pedestrian lobby is vocal, they are being heard AND they vote! I encourage you to start the wheels rolling (pun intended!) on this issue. a AAA member that does bicycle! I met Ray this morning while biking the Bridges Ride. He's from the mountainous, German-speaking section of Italy and he's staying at a Clearwater motel and biking around Tampa Bay. Ray owns six recumbent bikes, including this rig that he was ready to pedal across the Courtney Campbell Causeway. He's youthful-looking at 64, retired from running a golf club and making golf clubs. If you see Ray around St. Pete or Clearwater, say hi. in place since the Reagan administration! 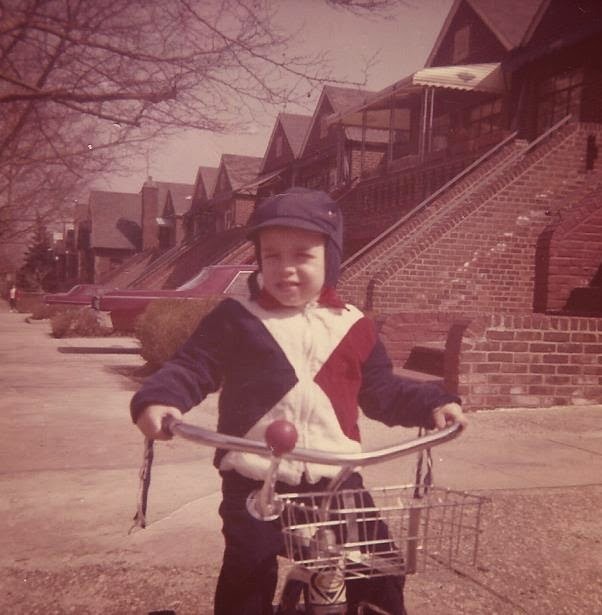 Written this Saturday morning before I bicycle nine/tenths of a mile to work! -- Section “C” is the northern most section of the Upper Tampa Bay Trail. The Double Ironman Is Here! For those who believe the Ironman distances are too boring and short I offer you the Double Ironman event at Flatwoods park outside Tampa. The headquarters is where I staged the SWFBUD Bicycle Bash at Flatwoods and I was told today that the Double Ironman begins Friday. Good luck to the contestants and happy carbo-loading. This morning I ambled over to the electric vehicle show in Tampa to check out the e-bikes. 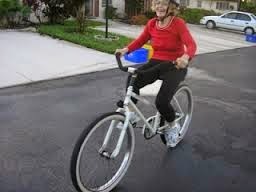 I'm a human-powered bicyclist myself, but I also believe in options for people who love to move on two wheels but might be too ailing to ride a bicycle via muscle power. Lots of retailers sell battery-powered bikes and retail power Trek is among the companies that offer e-bikes. I caught up with my friend and fellow bicyclist Rob Keith, who did marketing and PR for the electric vehicle event and met event organizer Victor Juarez, who is pictured above riding the high-powered pedi-cab. This folding e-moto bike was on sale for $799. There's always a display with a conversion kit that was used on these bikes. SWFBUD will be attending a Hillsborough County information meeting tonight regarding the proposed trail to connect the Upper Tampa Bay Trail with the Suncoast Trail. For nearly the past five years, SWFBUD has advised the Hillsborough County Commission to move forward with connecting these two regional trails and the connector trail is a top priority in the MPO bike trail plans. I am speaking on behalf of the thousands of bicyclists represented by SWFBUD's retail bicycle shops in advising you to please connect these two trails. For years, this has been discussed and the connection of the two trails is a long time coming. I hope you can attend tonight's meeting on the status of the connector trail that would link the Upper Tampa Bay Trail with the Suncoast Trail. 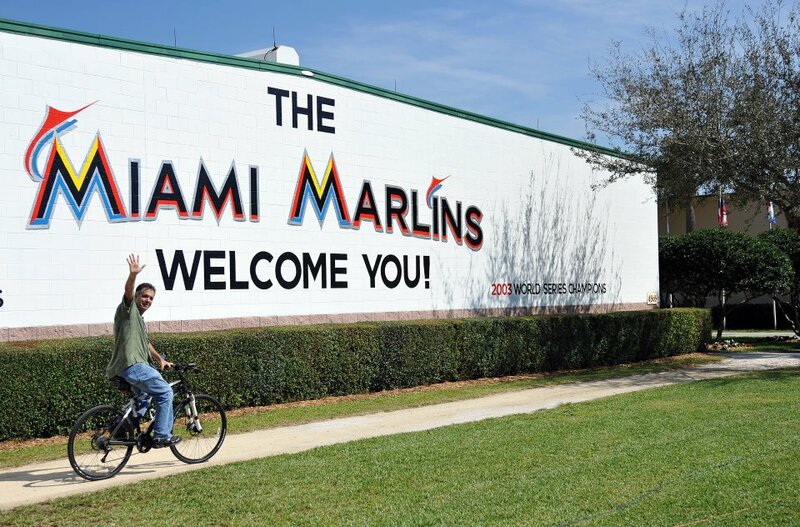 Marlins Beat Reporter Pedals To "Work"
Joe Capozzi covers the Miami Marlins for the Palm Beach Post and knows the best way to get to his beat at the Marlins spring training camp in Jupiter is via bicycle. Joe and I have the unique common experience of reporting about former Marlins president Don Smiley and former Port St. Lucue City Manager Don Cooper -- which was the highlight of our newspaper careers. The local Florida DOT office is holding a public information meeting on proposed improvements to US 301/State Road 41 on Tuesday from 5 pm to 7 pm at the FDOT District 7 office at 11201 N. McKinley Drive in Tampa -- just south of the USF campus. The proposed improvements are from south of the Tampa Bypass Canal Trail to north of Fowler Avenue. For bicyclists, you should know that the proposal includes widening 301 from 2 lanes to 4 lanes, with sidewalks and bicycle facilities (which I guess means bike lanes). Please attend and advise the DOT how important it is to have safe bike lanes on roads whenever they are improved. There's a Hillsborough County meeting Thursday to get comments from the public about the connector trail that would link the Upper Tampa Bay Trail with the Suncoast Trail. SWFBUD has for years lobbied Hillsborough County commissioners to connect the two trails. Please attend this meeting to voice your support for this connection. Section “C” is the northern most section of the Upper Tampa Bay Trail. It will begin at Van Dyke Road and the old railroad corridor that is now owned by Tampa Bay Water. The trail will proceed north to a point across from Wayne Road and Gunn Highway intersection; turn east proceeding along trail right of way accessing the Brooker Creek Headwaters Preserve. The trail will meander north along the western limits of the preserve to a trailhead along Lutz Lake Fern Road approximately one half mile east of Still Wood Drive. From here, the trail will continue east along the south side of Lutz Lake Fern Road via trail right of way to a signalized crossing to the north side. The alignment from here meanders along trail right of way until it connects to the Suncoast Trail at the Suncoast Expressway. 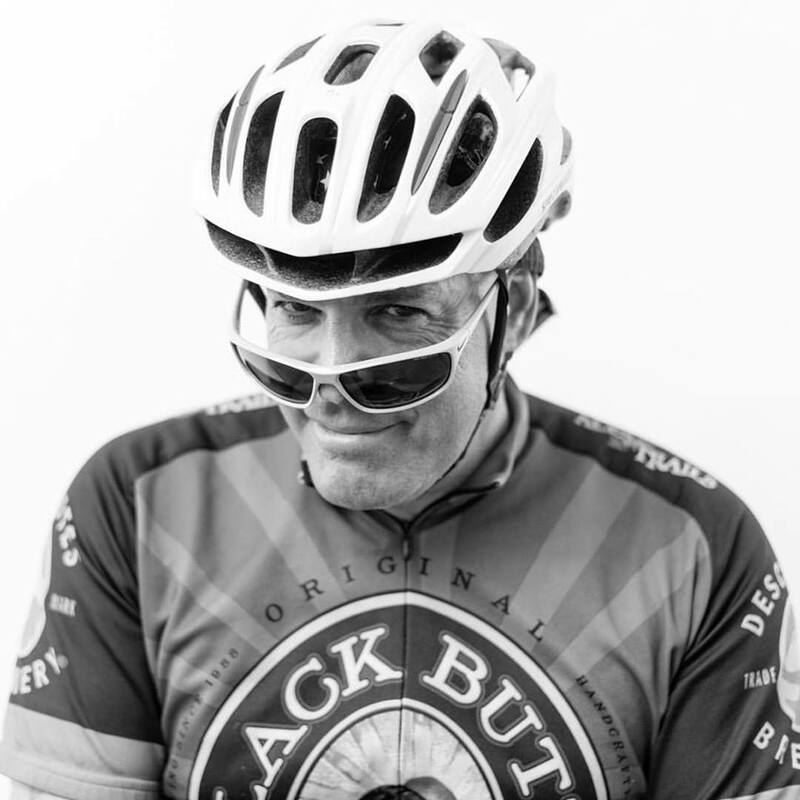 "To our customers, neighbors and the bay area cycling community. Our shop was broken into last night (Monday) at 9:00pm. A storefront window was broken out and a Cinelli cyclocross bike was stolen and later recovered. "Thanks to a neighbor, who while jogging, witnessed the break-in and called 911 following the prompt notification to TPD by our alarm company. "Any information regarding the incident will be appreciated. We are thankful that we have such careful neighbors, and hope with fingerprints and a witness, that we can catch this person. 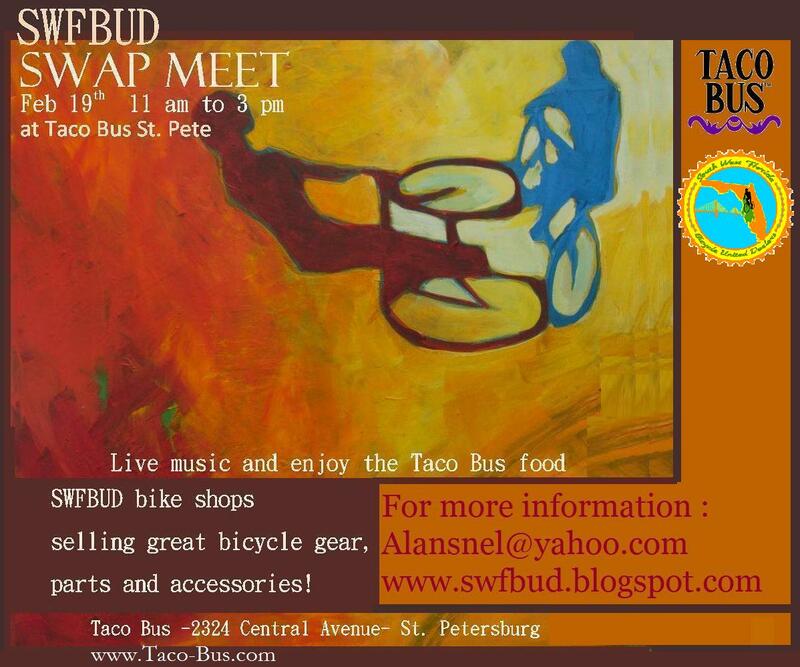 SWFBUD partnered with the Taco Bus in St. Petersburg to have a terrific swap meet, even with the breezy gusts and the occasional light rain. I spoke with many folks about the BAM Network -- Bicycle Area Mobility system to tie the Tampa Bypass Canal Trail, the South Coast Greenway and the Selmon Greenway into a unified highway system for bicyclists. SWFBUD bike shops also enjoyed meeting customers. Clayton had a good time selling from the back of his Yaris. More bicyclist deaths on the roads around the Tampa Bay area. Another bicyclist killed in Hillsborough County -- this time it was early this morning at 3 am on US 41. A report released in by the National Highway Traffic Safety Administration (NHTSA) found encouraging news in the grim annual toll of cycling fatalities: 630 "pedalcyclists" were killed in 2009, down twelve percent from the 718 fatalities reported in 2008. The overall accident trend is also down two percent, with 51,000 cyclists injured in motor vehicle traffic crashes in 2009, compared with 52,000 cyclists injured in 2008. The NHTSA figures are collected annually, but the 2009 data is the latest to be published by the government. Road ID founder Edward Wimmer noted, "It's a difficult issue to talk about, especially given the recent death of 19-year-old cyclist Megan Babb, but we are in the position of hearing about accidents literally every day, so these new figures are somewhat encouraging. The data can be a bit hard to find, but we hope by bringing it to the attention of the bike community, we can add our voice to the critical need for bike safety in our national transportation planning." Cycling fatalities account for just two percent of all motor vehicle traffic fatalities and injuries, with the largest percentage of these accidents occurring during the daylight hours between 4 a.m. and 8 p.m. (29%). Around 70 percent of fatalities in both 2008 and 2009 occurred in urban locations, with males making up the majority of this population (87%). Bob Mionske, a former U.S. Olympian in cycling and a leading lawyer for cyclists, said, "While I'm not ready to call this a trend yet, continued advocacy from the cycling community may be making a difference and can only help decrease these numbers." With winter in full swing, Road ID has posted a comprehensive series of safety videos on its website with tips for drivers and cyclists called Rules of the Road. Here are a few select tips to help cyclists and drivers navigate the roads safely. Obey all traffic laws: Stop at stoplights and stop signs. Signal your turns. Ride in a straight, predictable manner, keeping to the right -- but not so far right that you risk hitting the curb or debris. And always be alert for a car door opening in your path. Be aware of cars: Do not ride in a driver's blind spot. Ride where they can see you. Making eye contact with a driver is an effective way to ensure your safety. Make yourself seen: Maximize your visibility by wearing bright or reflective apparel designed specifically for bikers. Don t move into traffic lanes without looking first to see if it is safe. Defuse Road Rage: Minimize the risk of conflict by following the rules of the road and riding safely and courteously. No running red lights or stop signs. Wear identification: Bob Mionske recommends that cyclists wear identification, such as a Road ID bracelet. Road ID products are simple, affordable laser-engraved identifications that can provide life-saving information to first responders. Finally, and perhaps most importantly: wear a helmet. Always. Be aware of cyclists: The most common reason for accidents is drivers simply not noticing bike riders. On all non-freeway routes, expect to see and share the road with bikers and pedestrians. Use your turn signals to help cyclists know your intent. Share the road: Bicycles are "vehicles" too, and are entitled to use all roadways except for freeways. State laws differ, but most vehicle codes mandate that you pass cyclist with room to spare (3 feet) and only when it is safe. Pass with care: One of the most common accidents involve a car overtaking a bike and turning in front of them. Err on the side of caution, slow down and let a cyclist through an intersection before you make your turn. Information on traffic fatalities is available from the National Center for Statistics and Analysis (NCSA), NVS-424, 1200 New Jersey Avenue SE., Washington, DC 20590. NCSA can be contacted at 800-934-8517 or via the following e-mail address: ncsaweb@dot.gov. General information on highway traffic safety can be accessed by Internet users at www.nhtsa.gov/NCSA. To report a safety-related problem or to inquire about motor vehicle safety information, contact the Vehicle Safety Hotline at 888-327-4236. Just a reminder -- the SWFBUD Swap Meet is Sunday from 11 am to 3 pm at the Taco Bus St. Pete at 2324 Central Avenue in St. Petersburg. 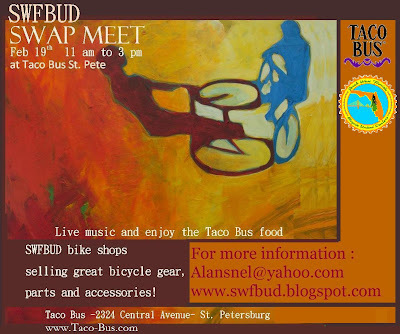 SWFBUD stores will be selling great gear, closeouts, clothing and used bikes -- and individuals can sell too for only $10. We have the Chocolate Mushroom Gravy Band playing live music and the Taco Bus will be serving its great food. alansnel@yahoo.com for more info or questions. 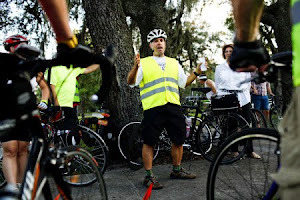 SWFBUD mourns the loss of another bicyclist killed on the roads of Hillsborough County/Tampa Bay area. This time in the middle of the afternoon at 2:04 PM Monday an 18-year-old woman was killed. She was crossing US 41 when struck by a Chrysler PT Cruiser. It was one year to the day that Dr. Robert Niedbalec was killed on Fletcher Avenue in Temple Terrace on Feb. 13, 2011. 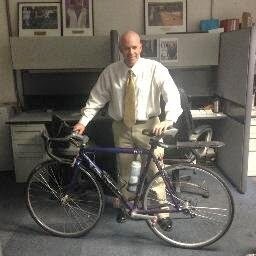 One year ago today, two motorists racing down Fletcher Avenue and driving erractically between 42nd Street and I-75 outside Tampa led to the death of veterinarian Robert Niedbalec of Temple Terrace who was killed while riding his bicycle in the bike lane by one of the drivers. SWFBUD thanks the hard work of the Hillsborough County Sheriff's Office, which arrested the drivers a few months ago. Here is the HCSO press release on the arrest of the drivers in connection with Robert's death. 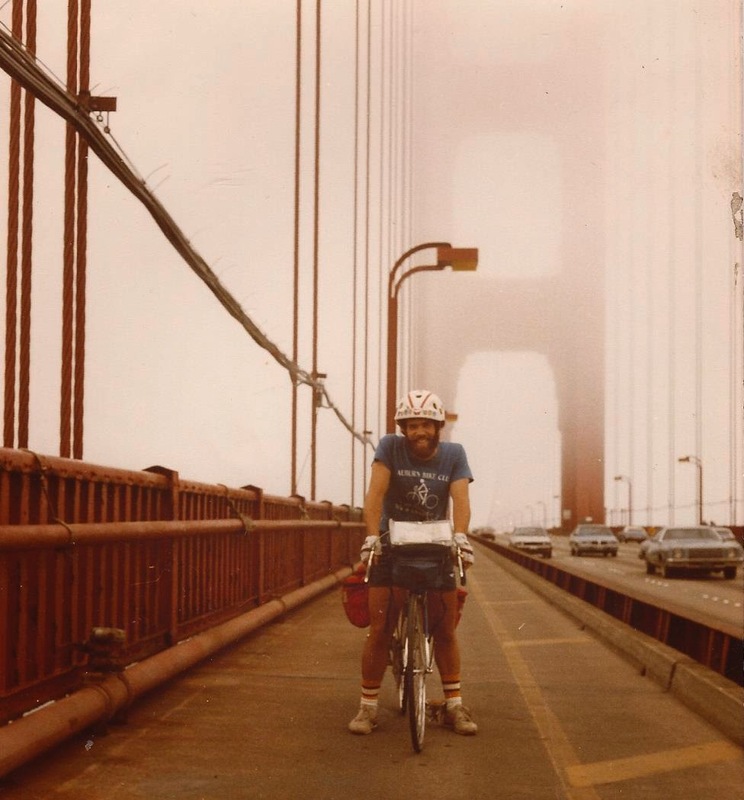 Daniel M., who lived in the area, installed the ghost bike in Robert's memory. The city of Tampa has extended a bike lane that previously ended about a mile and a half shy of downtown and now it's much more pleasant to ride a bicycle on the city's signature road. Sally Thompson, a trails and bicycle supporter, talks about how her parents used to ride a bike on Bayshore. City of Tampa, Take Down That "Bike Lane Ends" Sign! SWFBUD asked the city of Tampa for years to improve Bayshore Blvd -- and recently the city extended a former bike lane that ended a mile and a half from downtown. That meant the "Bike Lane Ends" sign could be toppled and removed. And it was this afternoon as city staffers removed the sign that was no longer needed. On my left is Sally Thompson, Jean Duncan, Jim Shirk and Beth Alden. A Tampa public works employee prepares to remove sign. A bicyclist came by and enjoys the new bike lane on Bayshore. Please tell Hillsborough County to build the connection trail between the Suncoast Trail and the Upper Tampa Bay Trail. 6:30 p.m. to voice your support. Construction Plans complete for trail from Van Dyke Road through the Preserve along Lutz Lake Fern to the Suncoast Trail at Suncoast Expressway. Some remaining funding issues to build all. Expected to build some portion now maybe all if FDOT LAP funds become available. Scheduled for September Construction NTP. Project will provide 4.3 additional miles of a paved recreational trail through a protected preserve offering the experience most never get a chance to see up close. Come and witness a fun moment when the Tampa public works department removes a "Bike Lane Ends" sign tomorrow at 1 PM on Bayshore. The city extended the bike lane on Bayshore and can now remove the bike lane ends sign. I'll be meeting the public works guys at 1 PM Wednesday for the fun moment and for some photos. Those steaks will get you every time Alberto. Michael Ploch shares his enthusiasm and support for cycling by backing SWFBUD and SWFBUD's BAM Network plan. Here's a T-shirt designed by Michael to support the BAM -- Bicycle Area Mobility -- in Hillsborough County. The T-shirt shows the BAM map designed by HOK architect Nico Stearley. Please contact alansnel@yahoo.com if you want a T-shirt. They're $10 each. I am writing to express my support for the expansion of the “BAM Network” for Bicycle Area Mobility. Aside from the inherent road safety benefits, the BAM Network promises to provide significant benefits in health, the economy and jobs, and tourism. Attached is information about BAM and contact information for the director, Alan Snel of the South West Florida Bicycle United Dealers (SWFBUD) organization. Also attached is a letter of support. I urge you all to write a letter of support for the BAM network so that our local government can see that the State is in support of this initiative. Alan is collecting letters from each Representative and Senator to submit in a packet to Tampa Mayor Bob Buckhorn, The Hillsborough County Commissioners, The Tampa City Councilmembers and the local MPO. I am writing to express my support for the expansion of the “BAM Network” for Bicycle Area Mobility. The construction of the three multi-use trails in this project will tremendously improve Hillsborough County and the city of Tampa. The project will add 30 miles of safe, paved trails, creating an integrated and cohesive network for riders, and more effective transportation for all. Aside from the inherent road safety benefits, the BAM Network promises to provide significant benefits in health, the economy and jobs, and tourism. Studies have shown large correlations among the amount of developed bicycle, and pedestrian trails in a city, and better health, higher rates of creativity, and more job opportunities and successful small businesses. Expanding the trails will also promote exploration and appreciation of our local gems of culture, heritage, and history by tourists and residents alike. I believe that the BAM Network will holistically improve our community and will contribute to a higher quality of life for all of us who call Tampa Bay home. My colleagues on both sides of the aisle agree that the BAM Network has the potential to help reenergize our city. I hope you will stand up with me for the BAM Network and Tampa Bay as we move our community forward.